PT Hanjaya Mandala Sampoerna Tbk - PT HM Sampoerna Tbk or referred to as "HM Sampoerna" is a leading and trusted public-listed tobacco company in Indonesia. HM Sampoerna is listed on the Indonesia Stock Exchange (IDX) with stock code HMSP. HM Sampoerna is a member of world leading tobacco company Philip Morris International. To date, PT HM Sampoerna Tbk is 92.75% owned by Philip Morris International through PT Phillip Morris Indonesia and 7.25% by general public. HM Sampoerna is a producers of the best-known kretek (clove) cigarette brand families such as Dji Sam Soe, Sampoerna A, Sampoerna Kretek, and Sampoerna U. HM Sampoerna is member of Philip Morris International family. HM Sampoerna is recognized as one of the largest tobacco producers in Indonesia as its controls about 33.4% share of market of the Indonesian cigarette market. 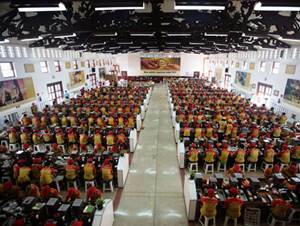 Based in Surabaya East Java, HM Sampoerna now has 7 production facilities. HM Sampoerna also supported by 38 Third Party Operators (TPOs) and 9 subsidiaries; PT Perusahaan Dagang dan Industri Panamas, PT Union Sampoerna Dinamika, PT Wahana Sampoerna, PT Harapan Maju Sentosa, PT Persada Makmur Indonesia, PT Handal Logistik Nusantara, PT Taman Dayu and Sampoerna International Pte. Ltd. HM Sampoerna sells and distributes cigarettes through a total of 105 sales offices throughout Indonesia. HM Sampoerna has recorded a significant growth and satisfactory performance in the business year of 2016. According to PT HM Sampoerna Tbk Annual Report 2016 as cited by JobsCDC.com, HM Sampoerna reported total net sales of Rp95.46 trillion in 2016. This total net sales equivalent with an increase of 7.18% year-on-year (YOY). HM Sampoerna's total net sales in 2015 amounted to Rp89.06 trillion. HM Sampoerna registered total comprehensive income attributable to owners of the parent of Rp12.53 trillion. This number is up 21% from the previous year of Rp10.35 trillion. Bachelor or Master Degree (S1/S2) in Environmental major with minimum GPA of 3.00. Holds around 1 – 4 years of experience in agricultural sector. Sound knowledge on Project Management and Statistical Software. Demonstrated good problem solving and analytical skills. Have solid communication and interpersonal skills. Willing to be placed in Pasuruan. Bachelor degree (S1) in Electrical Engineering with minimum GPA of 3.00. Must be fluent in English and Chinese language. Sound knowledge on QA processes and Quality Management System. Have experiences in conducting internal quality audits. The candidates who passed Registered Lead auditor training is a plus. Demonstrated good problem solving, communication and interpersonal skills. Proven leadership and organizational savvy. Willing to be placed in Surabaya for Indonesian and Hong Kong for Non Indonesian. Bachelor Degree (S1) in Communication or other majors are welcome to apply with minimum GPA of 3.00. Holds around 4-5 years of experience in relevant roles. Advanced knowledge of Finance Process will be an advantage. Able to use Microsoft Excel, Word, Visio, and Power Point. JobsCDC.com now available on android device. Download now on Google Play here. Please be aware of recruitment fraud. The entire stage of this selection process is free of charge. PT HM Sampoerna Tbk - Recruitment Staff, Lead, Manager Sampoerna March 2018 will never ask for fees or upfront payments for any purposes during the recruitment process such as transportation and accommodation.